Heads up, Bentleigh. There's a new kid on the neighbourhood block. Good Times Milk Bar isn’t serving up Gaytimes and lolly-bags…not exactly. 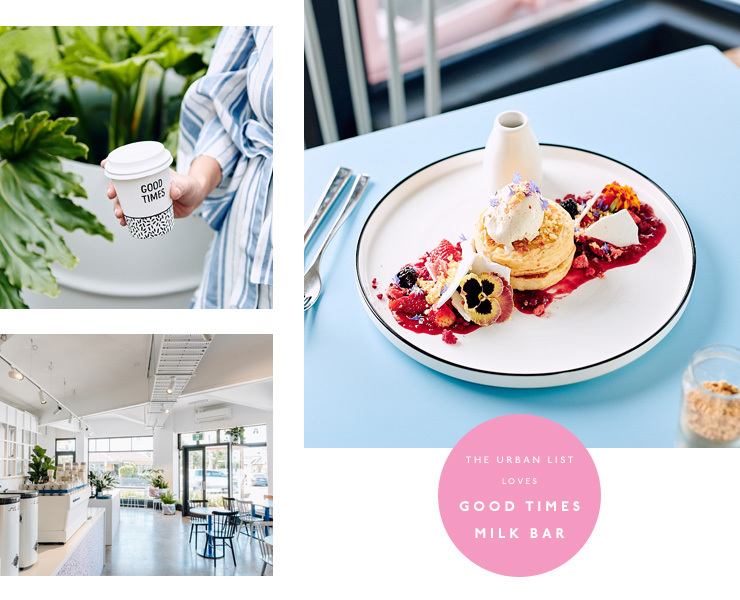 With a killer menu, great coffee, splashes of colour on the walls and green leafy plants growing all over the place, this is a 'Milk Bar' for the new generation. The whole concept of backstreet community cafés isn't new, but Good Times has certainly taken it to the next level. They wanted to focus on bringing Bentleigh together—it’s the type of place where the barista knows your coffee order, meet up with mates, or bring the pup (more on this below...). The 'milk bar' bit comes from the history: this was a corner milk bar for aaaaaaages. The sort of place where teenagers swiped Penthouse magazines and kids dropped by after school for vanilla milkshakes. The team gutted and refurbished the site, turning it into a chic brunch bar, with a killer garden out back. The feel is pretty contemporary. Kind of whimsical, really. Colourful walls, booth-style seating and park bench banquettes, plus graphic designs from Hours After Dark and a menagerie of monstera plants and hanging ferns. It's the little details that give Good Times its charm. Dog lovers will LOVE the designated puppy-garden out back, with squishy bean bags (livin' the dream), serving takeaway coffees and a smaller selection of food. It's the perfect area to soak up some rays ahead of a busy day. Moving onto the eats...brekkie is served all day (you heard that right) while some heftier lunch options get going from 11am (so you can have some cheeky tacos for breakfast—go on, we won't judge). The menu is monster-sized, and there's a good chance you'll find something for everyone. Got more of a sweet tooth? Head straight for the Salted Caramel Panna Cotta sprinkled with fig and spiced nut granola, or the Ricotta Hotcakes with meringue crumb, drizzled with spiced maple syrup and popping candy (nice touch, that). Savoury fans can chow down on Mooloolaba crab spaghettini, or if you want a lighter meal, they've also got a delicious range of fresh-made sandwiches and baguettes. The kiddies at the table won’t go hungry with mini-sized ricotta hotcakes, beef burgers or dippy eggs, so they can munch on something delicious whilst they sip a babycino. Don’t worry adults, we haven’t forgotten you either: Small Batch Roasting Company will quench your weekend blues with frothy goodness. Either slide into a booth for your morning brew or grab one of their uber-cute takeaway cups. Personally, we'll be relying on the bottomless batch brew to get us through the day. The suburban milk bar may be a dying breed, but community eats are definitely not. If Good Times is a little glimpse into the future of Melbourne suburbia, we say bring it on. Want to learn more about Good Times? Check out our Directory page.